James Harden leads the league in both free throw attempts and makes. The Houston Rockets' pairing of James Harden and Chris Paul has worked ... when it's been available. The Rockets are 16-2 in games that both Harden and Paul have played, but Paul has missed 17 games with knee and groin injuries. And now, Harden is out for at least two weeks with a strained hamstring. But the Rockets still have the league's third best record and are only a game in the loss column behind the Golden State Warriors in the Western Conference. Their offense has remained potent, and they've been improved defensively. Through Wednesday, they're one of four teams - the Warriors, Raptors and Wizards are the others - that rank in the top 10 on both ends of the floor. That has generally been the formula for contending for a title, though a team in Cleveland has defied the rules a couple of times over the last few years. The playoffs are still 3 1/2 months away, but the Rockets and Warriors will meet for the second time this season Thursday at 8 ET, the first game of TNT's double-header. The Rockets have scored 58.1 points per game in the restricted area or at the free-throw line, a rate which ranks second in the league. When we think about the Rockets' offense, we think about the 3-pointers first. They have taken 51 percent of their shots from 3-point range and are on pace to set the record for 3-point attempts for the third time in the last four seasons. But the most efficient ways to score are at the free-throw line (1.5 points per two-shot trip, league wide) and in the restricted area (1.3 points per attempt). Even corner threes (shot at 40 percent league-wide, 1.2 points per attempt) aren't worth as much as shots in the restricted area. 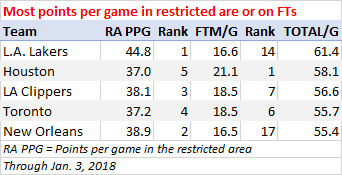 The Rockets rank sixth in the percentage of their shots that have come from the restricted area (34 percent) and second in free throw rate (31 attempts per 100 shots from the field). While the threes may be the more obvious story, the Rockets have scored 383 more points (10.6 per game) via shots in the restricted area and free throws than they have by shooting threes. While they shoot from beyond the arc at a historic rate, more of their offense comes from getting to the basket and getting to the line than from 3-pointers. The question now is how much the Rockets' ability to generate those points is hampered by the loss of Harden. Harden leads the league in both made (9.1) and attempted (10.5) free throws per game. He also ranks 18th (sixth among non-bigs) with 8.0 points scored in the restricted area per game. Put them together and only Giannis Antetokounmpo (22.4) and LeBron James (17.3) have averaged more points at the basket or at the line than Harden (17.2). But those aren't the only points that Harden generates at the basket or at the line. While also setting a record with 368 assists on 3-pointers, Harden set *a record with 483 assists on baskets in the restricted area last season. * Going back to 1996-97, when shot locations were first tracked. The previous high was Steve Nash's 479 in the 2007-08 season. This season, Harden's 168 assists in the restricted area rank second to Russell Westbrook's 181. When Harden has been on the floor, his teammates have shot 68 percent in the restricted area. With him off the floor, they've shot 62 percent there. NBA.com/stats Video:Watch the Rockets tie a season high with 50 points in the restricted area - 34 via Harden's points (8) or assists (26) - against New Orleans on Dec. 11. More than half (86) of Harden's restricted-area assists have been to Clint Capela, who can catch-and-finish lobs better than any other teammate. But Capela has averaged just 7.0 shots in the restricted area per 36 minutes with Harden off the floor, compared to 11.6 with Harden on the floor. The Rockets' numbers at the free throw line aren't just about Harden himself, either. Even when you take out Harden's own shots and free throws, his teammates' free throw rate has been higher when he's been on the floor (26 attempts per 100 shots from the field) than when he's been off the floor (24). The attention Harden draws on defense and his passing creates layups and trips to the line for his teammates. Chris Paul does the same, but not quite to the same degree. Harden (55 percent) and Paul (52 percent) rank second and fourth in effective field goal percentage on pull-up jumpers among 37 players who have attempted at least five per game this season. The threat they present off the dribble can help them get to the basket or find open teammates. But while 53 percent of Harden's assists have been on baskets in the restricted area, only 36 percent of Paul's have. The majority (57 percent) of Paul's assists have come on threes (the next best thing). And where Paul and Harden are so different is in their ability to get to the basket and get to the line. Harden has taken 31 percent of his shots in the restricted area. Paul: 13 percent. Harden has attempted 10.5 free throws per game and 50 per 100 shots from the field. Paul: 3.3 per game and 26 per 100 shots from the field. So, while Harden is out, we can expect the Rockets' shot chart to tilt more toward jump shots, both because of the shots their star guards take themselves and because of the ones they generate for teammates. Of course, Paul isn't trying to replace Harden, who should be back later this month. When they're both healthy, the Rockets will go back to always having at least one great playmaker on the floor. So far, in the 18 games that both have played, they've been at their best with one of the two on the floor, because their offense has stayed efficient, while their defense has been better against opponents' reserves. On Wednesday, in their first game without Harden, the Rockets attempted just 34 3-pointers, the second fewest they've shot in a game this season. The 33 shots they attempted between the restricted area and 3-point range were a season high (it was previously 24) and almost triple their average through their first 35 games (12.5). Houston took care of business in its first game without James Harden. They scored just 49 combined points in the restricted area (32) or at the line (17). It was still a solid offensive game and a comfortable win over the Orlando Magic, but it did knock them down from first to second (a hair behind the Warriors) in offensive efficiency. Further slippage is on the way, and it's more about the points that Harden generates inside and at the line than those from beyond the arc. 1. The Rockets have been the league's best first quarter team, having outscored their opponents by 18.1 points per 100 possessions in the opening 12 minutes. Only the third-quarter Warriors (plus-22.6) have been better than the first-quarter Rockets. But no team has been better offensively in any quarter than the Rockets have been in the first, when they've scored 120.8 points per 100 possessions. Among 135 players who have attempted at least 75 shots in the first quarter, Ryan Anderson (66 percent) and Trevor Ariza (63 percent) rank second and 10th in first-quarter effective field goal percentage. Harden has shot about equally well in the first and second quarters (effective field goal percentage of 59 percent), but has seen his shooting dip in the second half, and especially in the fourth quarter. Aligning with the fact that, when Harden and Paul have played together, they've been better with just one on the floor, the Rockets have been at their best in the last six minutes of the first quarter, outscoring their opponents by 24 points per 100 possessions (compared to plus-12 in the first six minutes of the first). The Rockets have held double-digit leads in the first quarter in 15 of their 36 games, winning 12 of those 15. Thanks to their strong starts, they've held the lead in 63 percent of their total minutes this season, a mark that trails only the Warriors' 64 percent. 2. The Rockets have been 11 points per 100 possessions better defensively with Luc Mbah a Moute on the floor (having allowed 97.3) than they've been with him off the floor (108.3)..
That's the sixth biggest on-off-court DefRtg differential among 261 players who have played at least 500 minutes (for one team) this season. It helps Mbah a Moute's on-off numbers that he comes off the bench and defends against other team's reserves. But as a starter for the Clippers last season, he also had a strong on-off DefRtg differential (the Clips allowed 7.0 fewer points per 100 possessions with him on the floor). In fact, *in nine of his 10 seasons, Mbah a Moute's team has been better defensively with Mbah a Moute on the floor than with him off the floor. The Rockets ranked sixth defensively through Dec. 13, when Mbah a Moute injured his shoulder in a game against Charlotte. Since then, they've ranked 25th defensively, having allowed more than 110 points per 100 possessions in 10 games without him. Injuries to Paul (who missed three of those games) and Capela (who missed five) were a factor. But the stretch hasn't been particularly harsh in regard to the offenses the Rockets have faced. Thursday's opponent will obviously be the toughest.